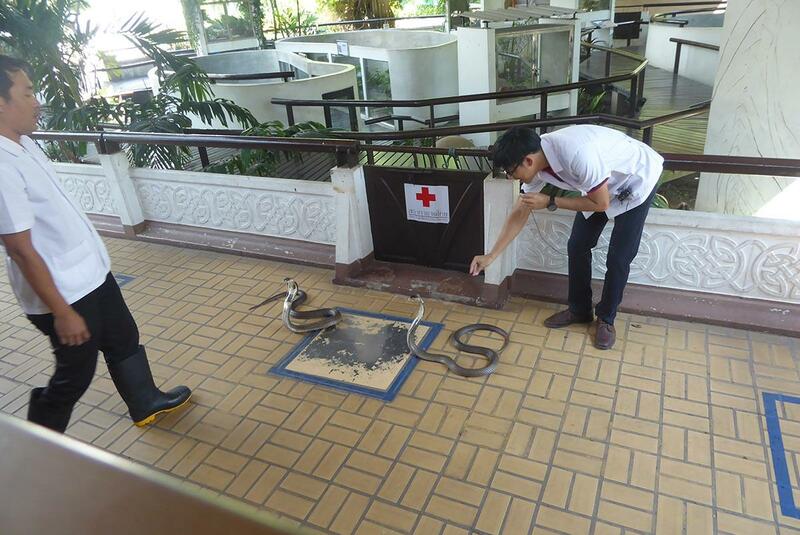 The Queen Saovabha Memorial Institute, popularly known as the Snake Farm is an institute run by the Thai Red Cross. 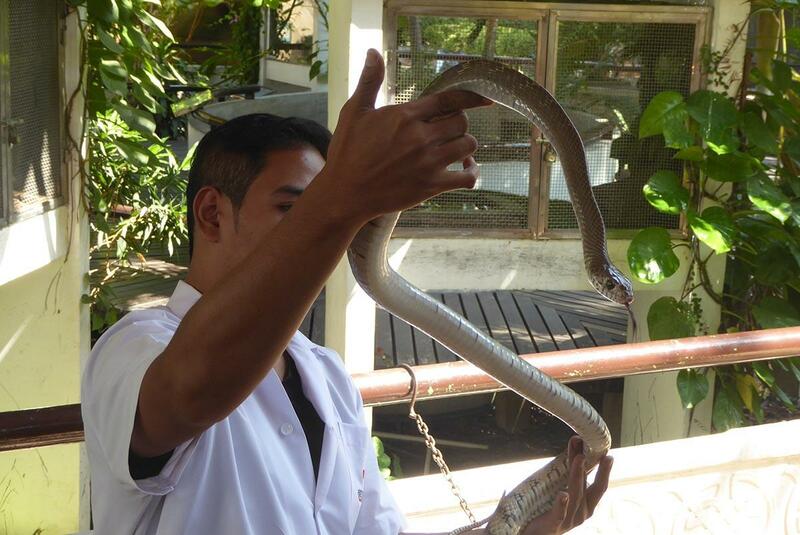 It runs research and breeding programs as well as producing anti-venoms for use in Thai hospitals. 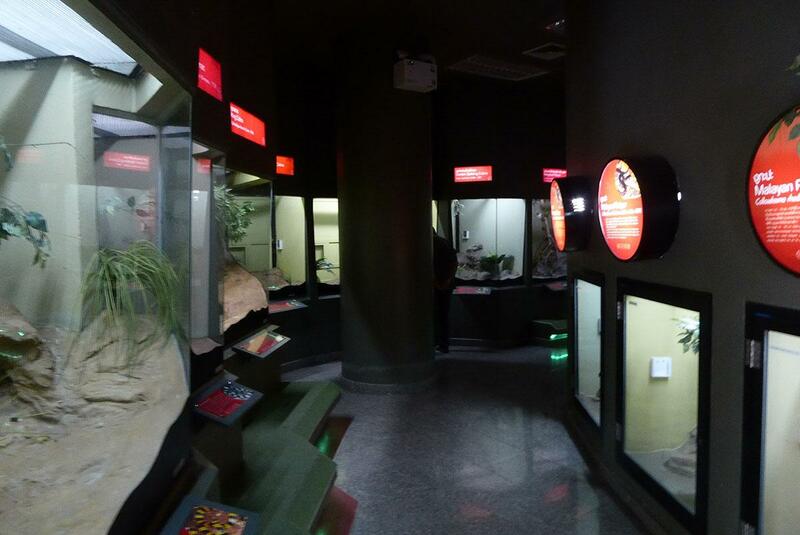 It also seeks to educate the public about the slithery creatures with an informative museum and entertaining daily snake shows. The farm is the world’s second oldest and is not a commercial enterprise like some snake shows that you can see in Thailand. 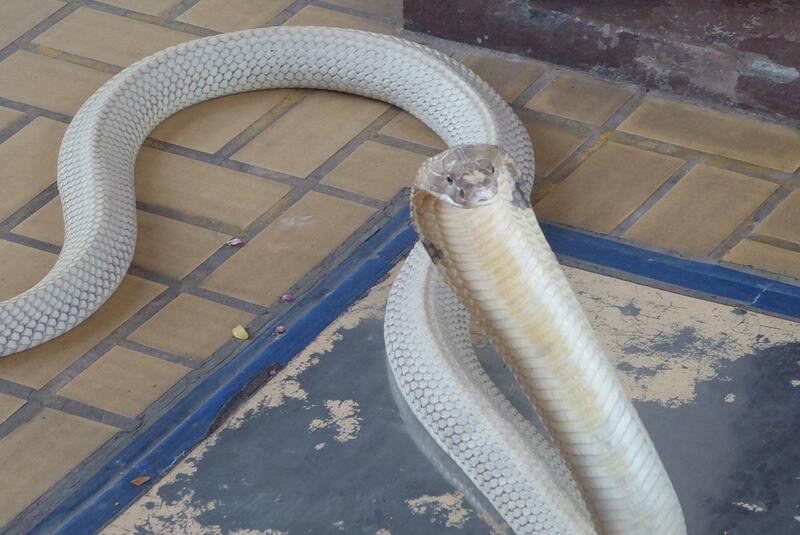 The snakes are treated with respect and are not mistreated. 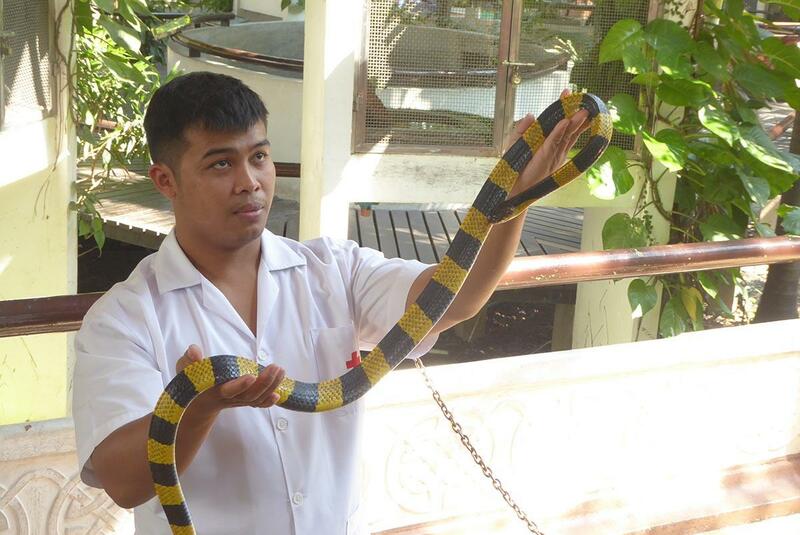 The farm contains a large collection of venomous and non-venomous snakes commonly found in Thailand and neighboring countries. 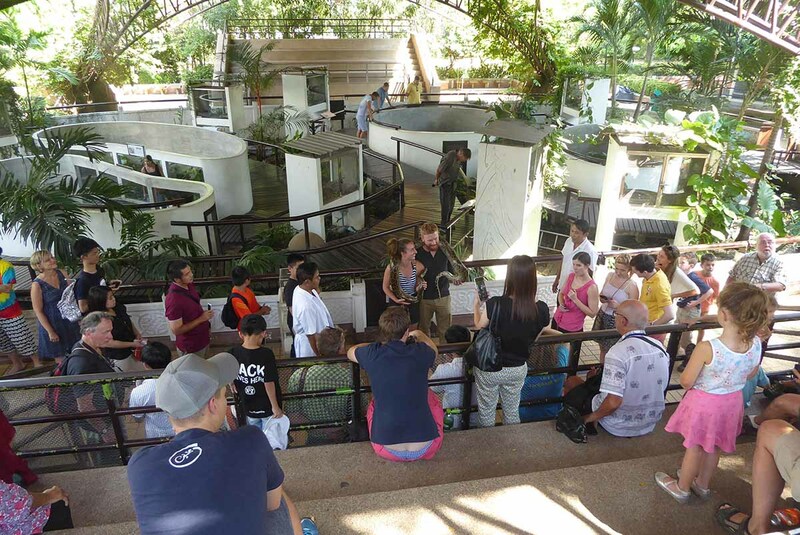 On entering the farm, you will enter a large garden area with a covered outdoor open exhibition of mainly non-venomous snakes in cages or pits. Each side of this area is a theatre where the snake shows are held. 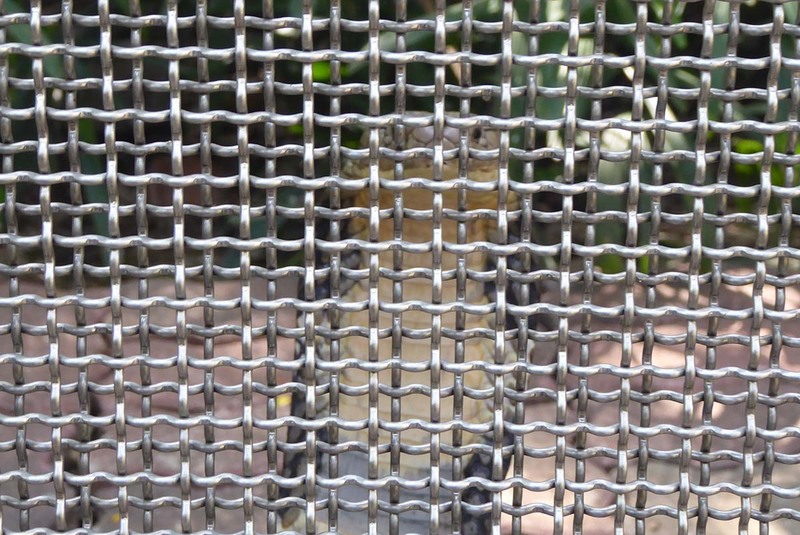 Behind the theatres, you will find large secure holding cages inhabited by King Cobras and Pythons. 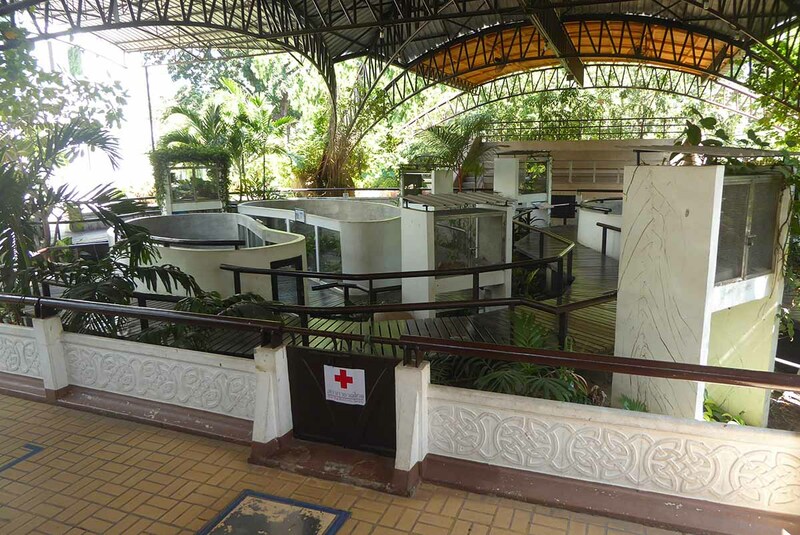 Behind the garden is a three-story building which houses on the ground floor a live snake house with mostly local venomous snakes such as Cobras, Vipers, and Kraits along with Pythons, Anacondas and Boas safely in thick glass enclosures along with detailed information on each snake. 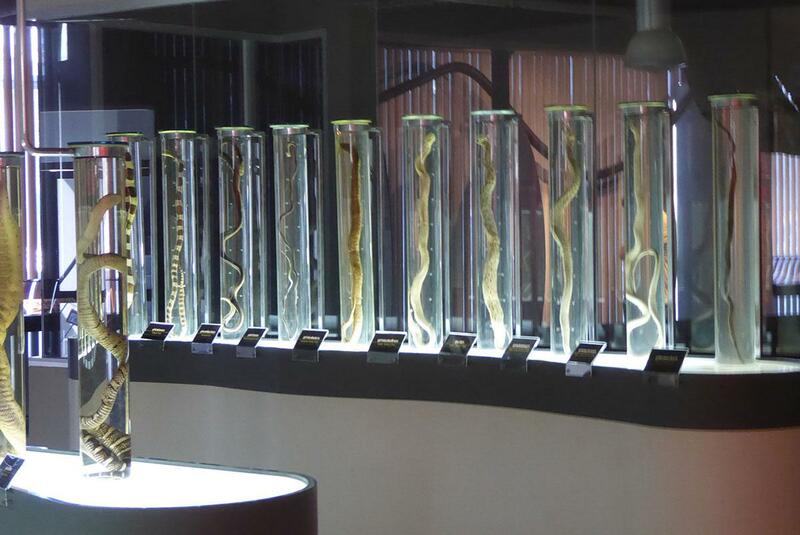 Upstairs there is an exhibition area with a 100-seat arena for venom extraction, a museum, an exhibition about the evolution of snakes, their anatomy, life cycle, reproduction, toxicology and information about snake bite first-aid complete with skeletons, preserved snake bodies and a model of a body of a snake bite victim. 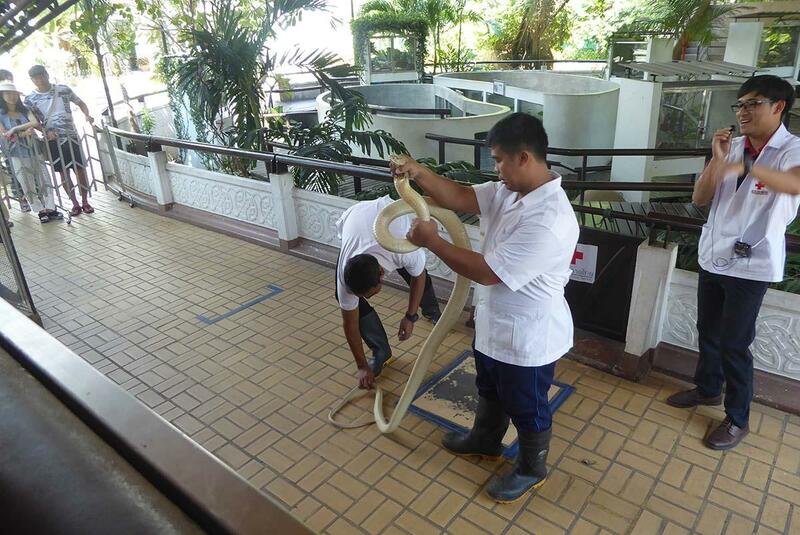 The poisonous snakes are milked daily for their venom to produce anti-snakebite serum. The milking takes place Monday-Friday at 11.00 in the indoor theatre. The fascinating snake handling show takes place Monday-Friday at 14.30 and at 11.00 on weekends and holidays, in the outdoor area. 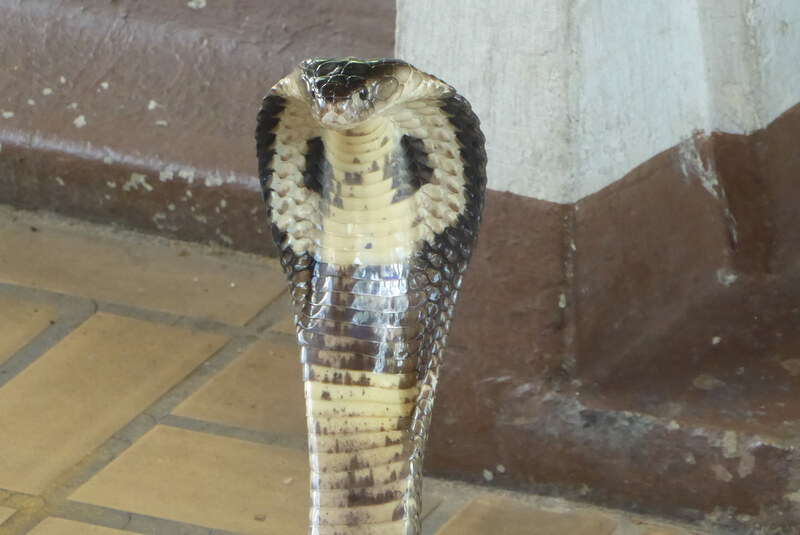 The show features highly dangerous snakes such as the King Cobra, Monocled Cobra, and Banded Krait as well as non-dangerous Rat snakes and Tree snakes. The demonstration is well presented in Thai and good English and is safe. It’s highly informative with information about each snake, it’s habits, where to find them, their venom and what to do if you get bitten. 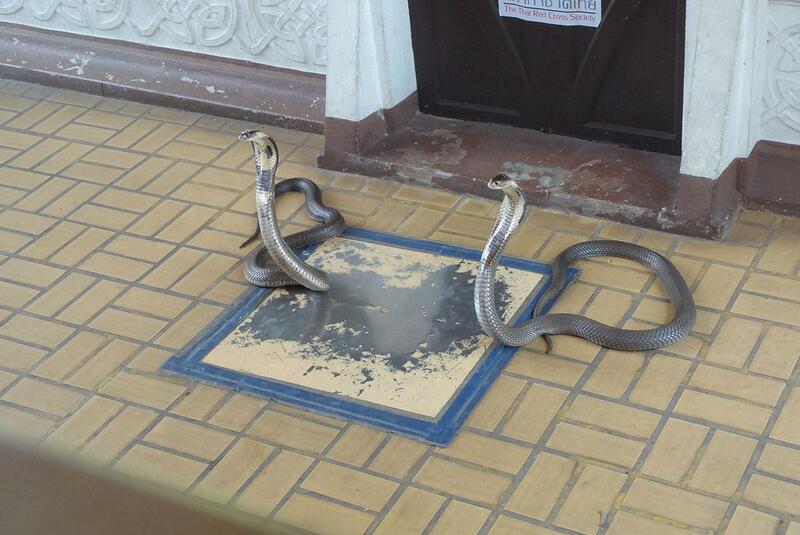 You also get a good close view of the snakes. 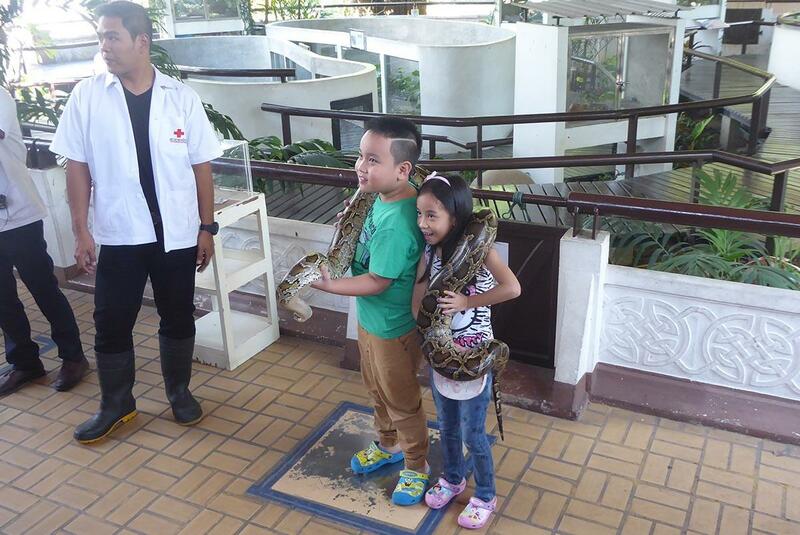 The demonstration ends with a large Python which you can pose with for photos if you dare! Tickets for the show are 200 baht for adults and 50 baht for children at the box office located at the entrance gate. There is also a small cafe there. The ticket covers the snake milking, the museum, and the live show. The ticket is only valid on the day of issue, so if you want to see the milking and live show you must leave and come back again as the farm closes at lunchtime. 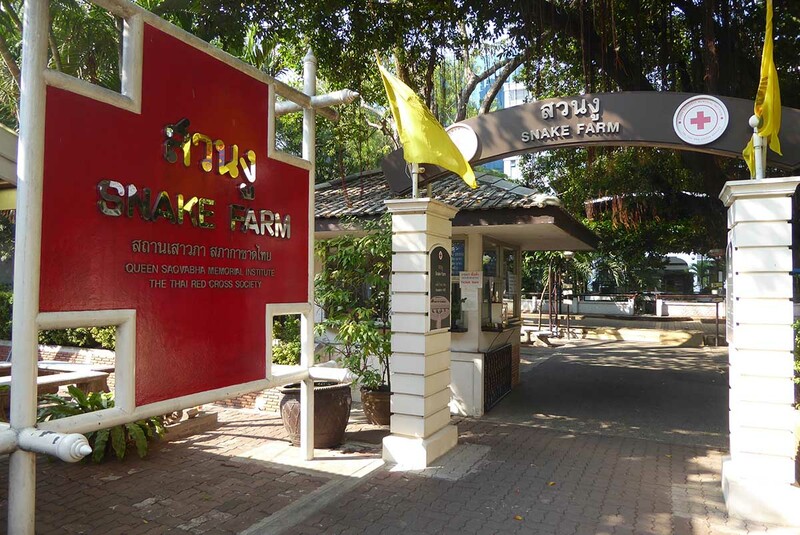 The snake farm entrance is on Henri Dunant Road about 100 meters from the junction with Rama IV Road and is easily walkable from MRT Si Lom, and BTS Sala Daeng or Siam stations. Location: On the corner of Henri Dunant Road & Rama IV Road. Admission: Adult 200 baht, Child 50 baht. MRT: Si Lom station, then a 10-minute walk. BTS: Sala Daeng station, then a 10-minute walk. Siam station, then a 15-minute walk.